More about Life: "There Ain't No Centre Clause"
"There Ain't No Centre Clause"
The Dutch don't tend to overdo many things, so one wonders why they have two Christmases. Last weekend, a bearded bishop came to Amsterdam attended by a huge parade of grinning Dutchmen in black face-paint. This was the arrival of Sinterklaas, a manifestation of Saint Nicolas, the patron saint of pretty much anyone and anywhere. Every year, Sinterklaas arrives on a steam boat from Spain with his Moorish servant (called Piet). Because Piet is never actually portrayed by anyone with any Moorish blood, he always looks like a Dutchman who has been playing in the coal cellar where he found a very cheap wig. In fact he alarmingly resembles a character from a very cheap and offensive sketch show from 1972. Right now, "Sint" and "Piet" (he's singular in the stories but appears manifold at parades, etc) are in the country, and getting ready for the big day. December 5th, also known as Sinterklaas, is when kids wake up to find gifts in their shoes left by the dynamic duo. There's also a ritual of wrapped presents accompanied by a small poem somewhat dissing the recipient. The presents, the foot-related receptacle, the old man with long, white beard is all very reminiscent of "our own" Christmas. Which is no accident. This is one seed of what we know as Christmas. Sinterklaas went to the US and got fat on Coca Cola; the shoe became a stocking; and the blacked-up Dutchmen became reindeers and elves. And these got added to the fir tree, holly and mistletoe from the original pagan Winter Solstice festival, bundled in with a wild stab at the birth-date of one famous errant rabbi to create the glorious celebration of consumerism that we today call "Christmas." And over the last few years, the Dutch have been increasingly celebrating Christmas (in the presents-and-overeating fashion of the movies) as well as their own earlier, modest festival. This is, of course, yet another example of the world's culture being thrown into the American melting pot and reserved back to the rest of the world and ultimately its original culture. Pizza is another great example. It's a highly interesting phenomenon that is almost certainly propagated by the medium of film. So the question I guess we all want to ask is this: who would win in a fight, Sinterklaas or Santa Claus? • Well, Santa Claus is old, but Sinterklaas appears much older and frailer. • However, Sinterklaas is quite lean and Santa Claus has been pouring in the Coca Cola for quite some years and is, well, a bit tubby. • Santa Claus has a well-trained team of reindeer with the kinds of hooves that could kick a man all the way into the New Year; Whereas Sinterklaas has a huge army of Piets, who have large bags of stone-like sweets to throw at children. There is no obvious winner on paper, but in my head the battle would be fierce and Manga-like. It will probably end with both parties being mortally wounded, leaving the way for a sequel. The real battle between Christmas and Winter Solstice: Jesus vs Sol. A heavyweight bout between the Son of God and the God of Sun. The so-called Rumble in the Wrapping Paper. I for one am looking forward to this. Your Sinterklaas Correspondent, Piet Moor. 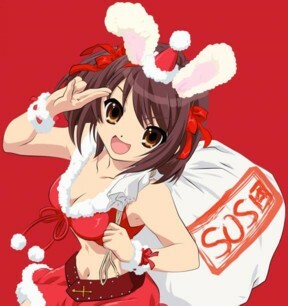 PS Here is what a Manga Christmas would look like (from The Melancholy of Haruhi Suzumiya by Nagaru Tanigawa and Noizi Ito). Happy Sinterklaas.